his recipe for Leberkäse (Leberkaese), by Mimi Sheraton, is from Stanz Favorite Recipes: in other words; Some of Mine, Some of Yours and Some of Theirs! , one of the cookbooks created at FamilyCookbookProject.com. We help families or individuals create heirloom cookbook treasures. Place ground meat on a cutting board or in a very large bowl. Gradually work ice water into the meat. To do this, pour a little water onto meat and knead with both hands until water is absorbed. I you do this very slowly and carefully, you should be able to work the entire quart of water into the meat onion and garlic together, twice, using the finest blade of a food chopper. Mix ground pork with the ground liver mixture, and remaining ingredients. Mix well until very thoroughly blended. Grease one or two loaf pans. Pack paté mixture in pans until each is almost full. It is not necessary to leave more than 1" of space at the top. Brush top of meat with cold water until smooth and glossy. Set loaf pan in a larger pan of hot water. The water should come about halfway up the sides of the pan. Bake in the lower third of a 350ºF oven 2½ to 3 hours, or until paté is cooked solid and is white throughout. 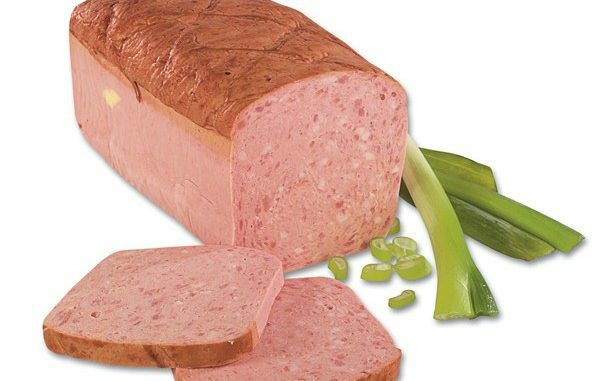 Leberkäse may be served directly from the oven or it may be stored in the refrigerator until you want to use it. It may be eaten cold, but it is much better hot. To heat, remove from refrigerator about 30 to 45 minutes before serving time. Cut off as many slices as you will need and heat in a vegetable steamer if you have one, or in the top of a double boiler that is set over simmering water about 30 minutes, or until meat slices are heated thoroughly. Variation: Cut Leberkäse in 1" slices and fry slowly in butter with some onion rings, until meat is brown on both sides and onions are soft and golden. Serve Leberkäse slices topped with onion rings and/or a sunny-side up egg.